Everyone has a different way of stashing their cannabis. Some people use simple plastic sandwich bags, some choose labeled medical containers from clinics, and some smokers swear by glass jars. Either way, we can all agree that we have come a long way from the brown paper bag of the ’70′s! While I can’t deny the usefulness of a plastic baggie, especially in the days when I had to hide my stash from my roommates in the college dorms, I dislike how dry my cannabis gets after a few days. The plastic pop-top jars from most dispensaries also do not offer an airtight seal, as anyone who has found an old stash under their car seat can tell you! 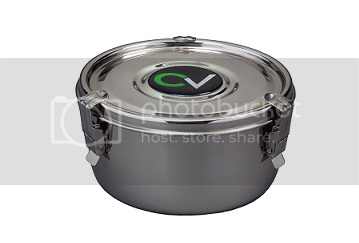 So I started researching new containers available to those with herbal storage needs, and I came upon the CVault from FreshStor, a stainless steel container that features climate controlled 62% humidifier packets and enclosures that ensure an airtight seal. Yeah, I know what you’re thinking. How is this container any different from taking a glass jam jar and putting a humidifier packet inside it? 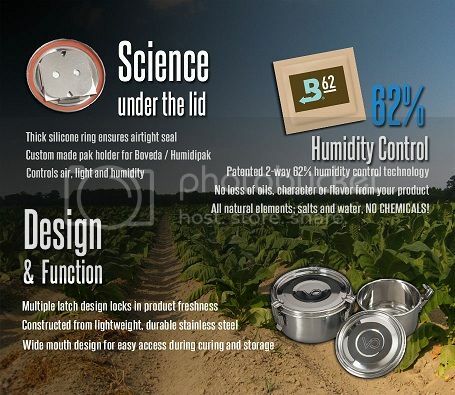 The answer is the 2-way Humidipaks that are custom made by Boveda, which respond to the temperature and outside climate of wherever you decide to store your medicine. The pack maintains an ideal moisture depending on the humidity of your environment. This container allows optimum, controlled storage for your cannabis whether you live by snowy mountains or sweaty swamps. I ordered a jar and have been storing my cannabis in it for the last week. I noticed a huge difference in my cannabis after only 24 hours of storage. The buds were stickier and had a more noticeable smell. Since the medicine was so dry when I got it from the clinic, when I checked the weight after one day in the CVault jar it even weighed a bit more! If you want to know more or know how to buy one, you can check out the website for the jars here! When was the last time you thought about where that medical cannabis came from? Most people who work in dispensaries will readily admit that they get their cannabis from outside vendors. This means that they have no clue about how the cannabis was cultivated, or any of the process that led to some guy with a backpack showing up at their door with a recommendation and a pre-paid cell phone number. After the unknown, it is the responsibility of the dispensary to keep the cannabis stored properly and in a sanitary way. As a person who has worked at many dispensaries, I have seen first-hand the unsanitary and unhealthy way that many of these dispensaries are run. The other day I went into a dispensary to purchase some medicine. The only problem was that I have been getting over a bad case of bronchitis, so I didn’t want to handle the cannabis, thinking that it would be nice to keep my germs to myself. When I was asking the guy to hold the jars up for me to smell, it struck me how disgusting it was that they allow people to just stick their hands into the jars. This is an example of an unhealthy practice that would be avoided if medical cannabis was better regulated. The next time that you go into a dispensary, look around. See how clean it is. I guarantee you that if you see trash in the front, it is ten times worse in the back. See if they use chopsticks or tongs instead of their fingers to weigh out. You have the right to know that the cannabis you purchase for medical benefit is handled in a sanitary way. Ask if they grow the medical cannabis themselves, or if they have had it tested and have laboratory information. Some dispensaries offer information about each of their strains, or have a farm run by collective members. These are ideal situations because you can verify the safety of your medical cannabis. Lab tests often include information about safety and the percentage of THC, CBD and other natural substances that have different medical effects. Medical cannabis is a great alternative to many medicines, but it is smart to be wary about your dispensary. You should be picky about what you put into your body. With no regulation or quality control being enforced by law, it is up to medical cannabis patients to demand not only safe, but healthy access. Support your local dispensaries that give good customer service and use sanitary practices. On the other hand, if a dispensary worker gives you a hard time about being picky, you can always leave! Take your money elsewhere. I guarantee that if enough of us do it, they will get the message. Vaporizing- definitely one of my preferrential ways of smoking medical marijuana. As an alternative to smoking a joint, vaporization avoids the production of irritating toxic and carcinogenic by-products by heating the material so its active compounds boil off into a vapor. A very delicious, vapor, at that. No combustion occurs, so no smoke or taste of smoke is present. It’s been said that long-term use decreases the chances of getting a “smoker’s cough”, and that injesting MMJ this way helps to conserve your stash- and I’ve found both of these things to be true. What is the best temperature to vaporize at? This is a debatable topic, and is mostly based on personal preference. Although I definitely recommend keeping your vaporizer between 200 and 350 degrees fahrenheit, it’s important to just take some time to get to know your vaporizer, the potency of the marijuana that you’re vaporizing, and your preference for the density of the vapor. I like to keep my convection “box” vaporizer at about 280 degrees fahrenheit, which is warm enough to for the CBD, CBN, & THC to vaporize without torching my herbs. Being modest with temperature also increases the number of ways that you can use the vaporized pot to make hash oil, edibles, et cetera. How do I know when there is no more left to vaporize? 1. Your vaporizer turns off automatically, and it knows you’re high. This is a common feature with these pieces of equipment, and oh how necessary it is! It isn’t very hard to forget you’re toking after a few puffs of some good OG Kush. 2. There is no more vapor pulling through your whip, or filling into whatever container you’re using to injest the vapor. How much weed do I use in my vaporizer? A gram or less usually does the trick! Pick out your prettiest little nug and break it up well- solid, “stone like” pieces will not burn as well if you pack them into the vaporizer whole. Can I still make use of vaporized weed? Although I’ve known people who actually smoke the vaporized weed, I recommend against doing that. For one, you’re already high, and two- the taste of a cashed joint is putrid. What you can do, though, is turn it into CannaButter for some edibles, dissolve it into Bubble Hash, or even make some Tincture. Marijuana has been called many things. Pot, weed, 420, smoke, trees- it’s all the same stuff, and medicine nonetheless. So all said and done, $25.2 Billion has been spent on these various facets of the Drug Control Strategy this year alone. With $9.4B of that being funnelled into U.S. Law Enforcement and Incarceration, you have to begin to wonder if that is a bit excessive, and where exactly are those funds being spent? How many less people could be homeless and fed right here in the US if a few billion of that federal budget was spared for humanity? The Obama Administration’s inaugural National Drug Control Strategy, published in 2010, charted a new course in our efforts to reduce illicit drug use and its consequences in the United States—an approach that rejects the false choice between an enforcement-centric “war on drugs” and the extreme notion of drug legalization. Science has shown that drug addiction is not a moral failing but rather a disease of the brain that can be prevented and treated. Informed by this basic understanding, the 2010 and 2011 Strategies established and promoted a balance of evidence-based public health and safety initiatives focusing on key areas such as substance abuse prevention, treatment, and recovery. Appalling, eh? I’ll remember these things when I vote this November, and I encourage you to do the same. Always a busy and fast-paced chef, as long as I have known him Mike has been running back and forth across kitchens in Southern California. Today he works at a wellness bar that gives seminars for the community called Earthly Juices helping people get healthy and detox outside of the medical cannabis realm. I chose to spotlight this chef because of his positive impact on the medical cannabis community, and the individuals that say he has greatly improved their quality of life. He selflessly donates healthy, medicated edibles to patients with cancer and other life-debilitating diseases. During our interview one thing was clear: this chef is passionate about cannabis as medicine, and the belief that as patients we need to come together and help each other. What is your personal experience with medical cannabis? I was working at a high-paced job in DTD, doing several hundred plates a night. My shoulders were hurting and my left hand was going numb, and they gave me muscle relaxers and painkillers. I started abusing them right away. I read in the paper and it said “Chronic back pain? Come get the chronic!” I figured I was going to abuse my pain killers and I should probably try to go get medical cannabis. I went to the doctor and they told me that I was a perfect candidate for medical marijuana because I didn’t want to be a drug addict and I knew I had beaten other addictions in the past. The first clinic I went to was 420 Primary Caregivers. I tried his edibles and the potency was great, but the taste was horrific. I went back and offered my services in exchange for meds. I started making the edibles and we had a lot of product available for me to experiment in. I got lucky in the sense that I had so much to work with and was able to hone my skills as a cannabis chef. What made you decide to donate to patients who were in need? Valerie Corral of WAMM (Women’s Alliance of Medical Marijuana) has been giving away medicine since 1996. They grow everything outdoor and they only take care of the truly ill. Towards the end of my time at OC Collective, I got to meet her and Jack Herer, Dennis Perron, and they spoke to us about why the law was written. The law is not written to make money off of patients. It is written for those who need the medicine and if they can’t afford it they are supposed to get it for free. We changed the law to make it so that collectives and the people who provide the medicine can make money off of it. I don’t have to be gluttonous with my medicine. It doesn’t hurt me to give away medicine to people who are really in need. All that happens is maybe at the end of the day, I can’t put that extra glob of hash on top of my bowl. Cannabis isn’t worth $50 an eighth, it is worth $5 an eighth. My electric bill and nutrients, everything it is only $200 a month for many plants. That’s not what Jack wanted, that’s not what Valerie believes in. I do it more because no one else does, and the clinic that I came from in the beginning had at least ten patients at all times who were getting free medicine because they were sick and in need. If I can work a regular job as a cook and still afford to pay my light bill, rent and everything, and give help to patients for free, why do we charge patients for this medicine? I offer to patients everything they need to learn about medicating, making edibles, detox and healthy eating, I do not just provide medicine alone. I want to teach patients to take care of themselves. I wish every collective did an evaluation of every patient as they came in. There is a difference between keeping charts on a patient and doing intake. Vaping classes, health classes, why is it so hard to find a collective that is dedicated to patient health? Chef Mike wants to know why we charge patients for cannabis? Why do we charge so much? How would you describe the effect of your raw medicated food on the patients? I would say that the effects I have seen: Less fatigue, healthier skin, more of an appetite, the Rick Simpson oil is more successful. Rick and Jack told us that the oil could cure cancer. Now I make patients grow their own meds and make their own oil. I can’t make enough to cure everyone, but I will show them how to make their own medicine. That is the better way. It is so much easier, better for me and for everyone. I have patients who have cancer; this guy I know just bought a house and he can grow his own meds now. He has been alive all this time off the meds I have given them. The raw and cleanse diet takes away the bodies need to expel energy on digestion, giving it more energy to use up on healing. Our body heals itself naturally, and if your body is only concentrating on the bad food you are putting in it, there is nothing left to heal. If you don’t take care of yourself in other ways, my cannabis is not going to help heal you. Your body needs natural energy and you can overload people on THC. You are still feeding the monster inside with the sugars and fats. When you eat a big steak, sure it tastes good, but think about how exhausted it makes you after. Think about patients and how exhausted you see them, just to get out of bed. They have a sugary, fatty breakfast. Being a stoner isn’t an excuse to eat bad food. You can have the munchies and still eat good, raw food. Instead of picking up a burger, eat a piece of fruit. You will get higher because your body is happy. Inside it is telling you thank you. When you eat fatty foods you get gas, bloated. I feel like I get way more stoned off my hash oil pills since I have been doing cleanses. Two years later, I eat no red meat, and when I ingest cannabis I get a way more potent effect. When I was eating meats and bad foods I was ingesting intense amounts of hash every day, all of the time I used to try and get super wasted. Now I can do it once a day or every few days and feel a more intense effect than before. Are your edibles available in any local dispensaries in California? No, because I think I can do more good on my own. I can do more by helping patients by a one on one basis and for free. The reason why I don’t have edibles anywhere is that I won’t put sugar, I won’t put preservatives, I will only do raw food. You can’t just think about the THC, you have to think about the health. As edible makers and collective owners we are treating patients. Even if we are not doctors or nurses we are still treating the patients. I will not subscribe to the belief that just because we put medical marijuana in it, it is good for patients. It is not medicine if we put sugar. I tried to come out with a raw line already and no one would buy it because they wanted edibles that can stay on the shelf for a week or more. I got sick of the collectives and the greed. There is no one to trust in the collectives any more. It is so hard to find a collective that will work with me for patients, with my diet plan and exercise programs, no one wants to do it. That’s why I believe I can do better on my own rather than in a dispensary. What else is on your plate at the moment? I am trying to create and would love help with the Cannabis Gastronomic Society. I want to get chefs together and have patients come and buy a plate from us. Once a month, we could come together, collaborate on a menu, and celebrate good food and good cannabis. We need to come together and talk about what medicine is, and the difference between cannabis food and cannabis medicine. Most cooks out there are making stoner edibles, not thinking about making healthy and effective edibles. Most chefs and collectives think that their strains are their property and we need to move away from that. We need to share knowledge and medicine freely. If a patient has a recipe for a tincture that they make and it’s helping them but no one will listen to them b/c there is no way to make money off of it. As chefs, it is our responsibility to come together and have great meals made, show all we know openly, and share the knowledge that we have acquired. My meal is different than anyone else’s. The plants should be for everyone. The meals should be for everyone. How many chefs are out there making store bought mix, and calling it medicine when it is just sugar and fat? These chefs are hurting the industry because the doctors will never give cannabis as medicine if the medicine is a bunch of sugary junk. We will never get legitimacy if that’s what we allow. We need to be more invested in patients and teach them how to grow healthy food and good cannabis plants. I want everyone to go back and read Prop 215. Explain to me where it say we can profit off of patients, where it says I should jack up the price and give less potent medicine so I can make more money and advertise more? Explain to me where that is and then I will think highly of collective owners who make millions. I have put out calls to the community where I had patients stuck at home, sick and dying and I couldn’t make it, and no one would go and help them. The clinic I came from, we were taught to go and help the [patients. I was sent to hole the hand of a wife whose husband was dying in front of us. I am disgusted with the industry, places don’t care about patients… they don’t care about medicine; now they only care about stoners and stripper poles. Why is the street dealer becoming more knowledgeable than the average chick who works at a collective? Problems like this only bother real patients. If you are there to get stoned, of course the current state of collectives is awesome to you. Putting the money in front of the patients doesn’t help people. Now I understand why my old boss Steve used to kick out the pot shoppers who weren’t real patients. At some point we have forgotten what is important. Please remember Earthly Juices is a health and wellness bar that does not offer any services or product to or for medical cannabis patients. They do have great detox programs and it is a great way to get your body aligned and heal. Please do not come into the store and ask for cannabis. 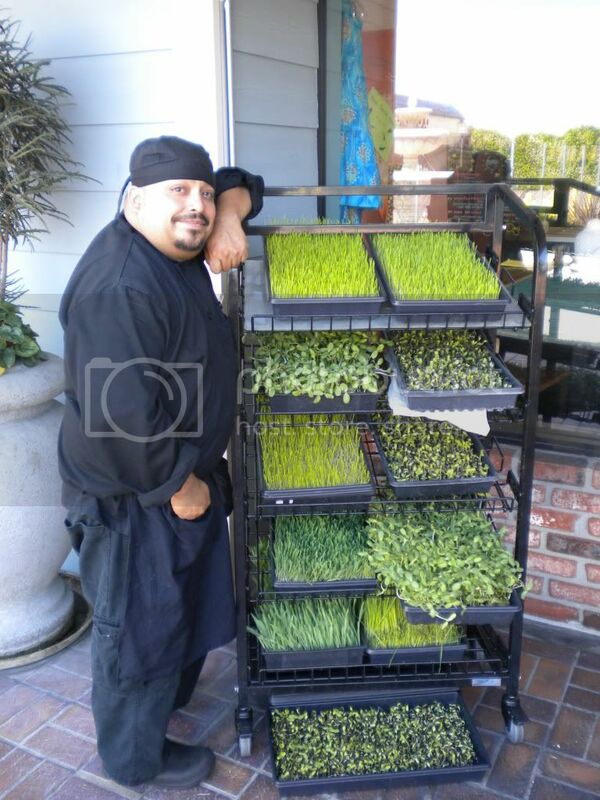 You can contact chef Mike directly at ediblesbymike@msn.com. When I hear the word “vegan”, many images come to mind. Sprawling plates of tofu sandwiches, cheese that’s somehow made of veggies, and a whole lot of green in between. Now-a-days it’s pretty easy to find just about anything in “vegan form.” Whether it’s soy bacon or buffalo tempeh burgers, the fact of the matter is that it’s pretty much all an option for the animal lovers out there. Thankfully, vegan is no longer limited in it’s definition to foods and cosmetic products- you can actually grow your weed with no animal products, too! Enter: veganics. In other words, if you’re growing veganic, you’re not using any poop! With this style of growing, there is no guana or bloodmeal being used at any point in the process. I recently sat down for lunch with Marvin Moses, a good friend and owner of Hills Farmacy, a dispensary in Oakland, CA (www.hillsfarmacy.com). After a bowl (or two) of one of his favorites, Starberry Cough, Mr. Moses shared his knowledge about growing veganic. Although he wouldn’t give up the exact recipe for the substrates that his one-of-a-kind products are being grown in (all of which are strains unique to Hills Farmacy), Moses did assure me that the foundation of each custom blend is a mixture of various composted liquid plants and teas. This, when paired with some unique pruning techniques, makes for an ultra clean finished product- and some pretty beautiful flowers. Both the taste and the smell of the veganic products is very much more rich and flavorful than what I am used to, and the smoke is dense but not nearly as harsh. The veganic effect is much more fortified and (for me, at least) lasts a bit longer than the high experienced when smoking non-veganics. The (growing) appetite factor with these products is bit quicker to show up, and comes stronger than I first expected. It wasn’t long after a toke or two that I was chowing down on some vegan delights for the occasion. Rest assured, though, that my body never left it’s state of perfect relaxation. Has anyone else grown or smoked veganic? How’d it go? It just so happens that cannabis is one of the easiest plants that you can grow. In fact in many parts of the world today you can find it growing wild. It’s for sure not top grade but it is weed that you can smoke if you wanted to. Wild cannabis covers a hillside above a village in Nepal. So when it comes right down to it, getting a plant in the ground that’s going to produce you about a pound of bud or so really isn’t that difficult a task. Being the one who gets to pick it however, is an entirely different story because patch bandits have always been a problem for home growers. So one option is to grow your crop indoors and as long as nobody knows about it you’re pretty much covered there. Indoor growing is an expensive proposition though, compared to the, say the $30 or so that you’ll spend to grow a nice fat bush in your backyard. So keep on reading because the following are five helpful tips that you can use to keep ‘sticky fingers off your sticky buds’ at harvest time. Tip #1 is to not let the fact that you have a nice fenced in yard in an upscale neighborhood lull you into a false sense of security. All it takes is just one of the neighbor kids to get a peek over the fence and for the rest of the growing season he’ll be dreaming every night about all the weed he’ll have after he snags your crop. Eco-friendly pots made from compressed bamboo are always one option. Tip #2 is to consider getting yourself a dog if you don’t already have one. Not just any dog either, but a “serious” guard dog. Now the number one breed preferred by professional pot growers is the Pit Bull Terrier but if you’re not up to that then consider something like a German Shepherd or Doberman because barking just isn’t enough, you need a dog bites. Tip #3 is to consider building a nice solid greenhouse to grow in. I greenhouse serves three purposes. First it conceals your plant or plants from prying eyes so that solves that problem. Secondly a good solid door with a lock on it stops the honest thief. Then thirdly breaking and entering is a felony that the police have to follow up on if you do end up losing your crop. That is if you’re growing legally of course. Tip #4 is to buy seeds of a fast budding strain when you shop online. All strains of cannabis don’t bud at the same time and speed, so some of the quicker budding strains like Afghani Hash Buds can have you harvesting and snipping your buds as much as a month earlier than you normally would. Hash Bud strains are also shorter growing plants, so they won’t be ‘sticking up’ so much. A small investment that can save you a whole lot of heartbreak. Tip #5 is to consider growing in large pots with castors on the bottom. You can get up to a pound of bud per plant grown in a 15 gallon pot if you use a premium soil blend, foliar feed, and don’t burn the roots by over fertilizing. Casters will allow you to roll your crop indoors each night, so they’ll bud up quicker and be out of reach of patch bandits. Then your last word of advice here is that “a bird in the hand is worth two in the bush.” So before you start in planting a giant crop in your backyard, consider your options and risk factors. You might be better off with one or two plants that can manage well and be able to do what it takes to keep them safe. That versus growing a bunch of plants that will have every teenager in your neighborhood climbing over your fence to get at them. Medical marijuana supporters in Butte County, California gathered enough signatures on Tuesday to rescind an ordinance banning MMJ dispensaries in the county – on the very day the a referendum about growing the plant was placed on the ballot. The MMJ advocates turned in a total of 12,025 signatures in order to rescind the ordinance, or at least make sure it was placed on the ballot as well. The necessary number of signatures in order to suspend the ban was only 7,605. The ban will now NOT go into effect on Saturday as originally planned. The petitions will be sent to the county registrar of voters to be verified. The staff there has thirty business days to check the signatures. If too many of the signatures are found to be invalid, the ban will go into effect immediately, but if the referendum is certified with enough valid signatures, the county Board of Supervisors will take a vote at its next regularly scheduled meeting to either rescind the ordinance to put it to a vote. Supervisors have the ability to either call a special election, or place the issue on the next regular ballot. The Seattle Weekly has reported that TSA agents at the Seattle-Tacoma (Sea-Tac) airport seem to be better-informed about the rights of medical marijuana users in Washington than many other members of the Federal government. This was proven when one of their reporters recently went through the security check-point with his MMJ. He put it in the bin to be scanned as he passed through the body scanner. They examined it, checked his documentation, and handed it back, all with minimal fuss. San Francisco and Oakland airports in California have also been referred to as “MMJ Friendly” airports, but as with all things that involve either the TSA specifically, or the recent federal crackdown on dispensaries and growers, it seems to largely be a question of who is on duty at any given moment, and what their own attitudes are. (Not that this should come as a surprise. Most TSA agents aren’t even up-to-date on the fact that you’re not required to remove iPads or Kindle ereaders from your carry-on, the way you do a full-sized laptop. Nevertheless, it’s encouraging to know that at least some TSA personnel apparently understood the memo from Deputy U.S. Attorney General David Ogden that was disseminated last month. If you aren’t already watching NORML’s weekly videocast, This Week in Weed, you should be, because it’s a great round-up of breaking medical marijuana news.